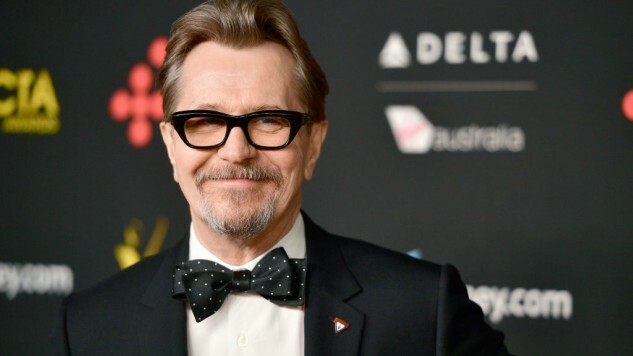 Gary Oldman may return to play Winston Churchill, but this time in the theatre. The Darkest Hour actor is currently kicking around the idea of adapting Churchill’s short story, titled The Dream, for the stage. “I read plays, I love going to the theater. I flirt with it all the time, going back. And I adapted something actually recently and I’m thinking about getting that on its feet,” Oldman said during a Feb. 14 interview at Loyola Marymount University’s School of Film & TV, per THR. It’s the ghost of his father, Randolph, who visits him in his studio at Chartwell. It’s two people, not an expensive thing to do. They [the Churchill family] are happy, they’ve given their sort of, the family are who have embraced this film and the portrayal, and so they’ve sort of given their blessing to it. So it might be something I’ll try and get on its feet. I long to go back. It’ll be quite terrifying, I’m sure, after 20 years. Interestingly enough, Oldman was initially very hesitant to take on the role of such an iconic figure in history. When asked about whether he thought it was a mistake to take on the role, he said, “Oh yeah. All the time. Yeah. Racked with insecurity. I turned down Churchill many times. And didn’t want to do it. Didn’t want to go near it. And, ultimately, I think it was fear. And you’re walking in the shadow of [others].” Several films have been made about Churchill, with perhaps the most famous being the HBO film The Gathering Storm, with an incredible Albert Finney playing the character. Finney was a major role model for Oldman when he first started out acting in theatre. Oldman was even turned down from Royal Academy of Dramatic Art in London, where Finney had studied acting. Without a doubt, Oldman has done more than alright, having just received his second Academy Award nomination for his transformative performance as Churchill in Darkest Hour. He has already won a Golden Globe, SAG award, Critics Choice and a BAFTA for this role, and is looking like the major frontrunner at the Oscars this Sunday. I started with the physicality, because I think one has an idea of, people have their own ideas of who he is, who he was, an image of him. And I think I was contaminated, my own thinking about him was influenced perhaps by other people that have played him, and he’s been played many, many times before by wonderful actors. And then going to the material, the source material and looking at some of the news footage, I’m not playing a life, a whole life, so I could (be) specific … I could hone it down to an area of his life. And what I discovered, the revelation to me was that he was energized, dynamic, cheeky, a twinkle in the eye, very cherubic. A powerhouse. And that was the key to unlock him for me. That he wasn’t this curmudgeon, grumpy man that had been born in a bad mood, that shuffled around you know. He was a dynamo. And so that was the start of finding that running condition of the motor, you know. Towards the end of the interview, Oldman even teased a possible sequel to Darkest Hour surrounding the 1945 Yalta Conference where Churchill, Franklin D. Roosevelt and Joseph Stalin all met. All of these possibilities are still in the early stages but it would be quite interesting to see Oldman become Churchill on the stage and again in film. However, Oldman said he really needs “a break from the makeup chair.” Unsurprisingly, the actor spent several hours being made up before each day of shooting in order to look almost exactly like the former Prime Minister. This, of course, remains a hypothetical maybe, but nevertheless we’d be pretty excited to see Oldman return to play the “British Bulldog” once again. Read Paste’s review of Darkest Hour here and watch a behind-the-scenes clip from the film here.